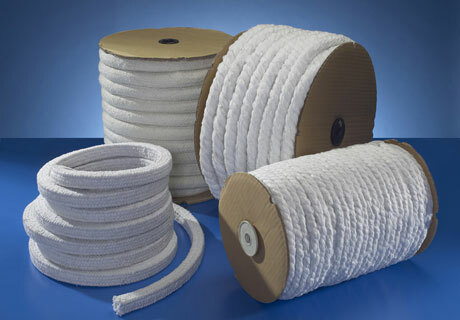 Ceramic Fiber Rope can be used in various thermal equipment and heat transfer systems for fireproof, fireproof, thermal insulation and friction materials. High temperature resistance, low thermal conductivity, thermal shock resistance and low heat capacity. Excellent high temperature insulation performance and long service life. It has anti-melting aluminum, zinc and other non-ferrous metals. Has good low temperature and high temperature strength. Non-toxic, harmless, no adverse effects on the environment. High temperature labor insurance products, fireproof clothing, high temperature filtration, sound absorption and other alternatives to asbestos applications. 1) Continuous use temperature up to 1050°C (stainless steel wire reinforced), or 650 ° C (glass wire reinforced), the former can be used for a short time up to 1260 ° C.
2) Ceramic Fiber Rope has good resistance to acid and alkali corrosion and resistance to molten metal corrosion such as aluminum and zinc. 4) Ceramic fiber cloth, tape, packing and other products using alkali-free glass fiber yarn as reinforcing material, which has higher electrical insulation and high-temperature electrical insulation than glass fiber.